Bristol City owner Steve Lansdown says getting the League One club's stadium redevelopment under way ends "seven years of hell". City had hoped to relocate to a nearby site, but the move was severely delayed by an application for a town green. Instead, a £40m revamp of their current home, Ashton Gate, will take place over the next two years, with Bristol Rugby also playing there from next season. "It's a relief," said Lansdown, before the start of the renovation on Monday. He told BBC Radio Bristol: "I've been through seven years of hell trying to get a new stadium for Bristol City. "We've now reverted to making Ashton Gate a first-class stadium and we're now at a point where we can start." Plans were approved in 2009 for Bristol City to move to a new site at Ashton Vale, but fervent opposition by residents resulted in two planning inquiries and an abandoned judicial review. The club confirmed last year that they had opted to rebuild their current home and plans were approved in November. The first stage of the redevelopment started on 27 April, with the pitch being dug up and replaced. The Wedlock and Williams stands will then be rebuilt while the other two stands, Atyeo and Dolman, will be refurbished and altered. 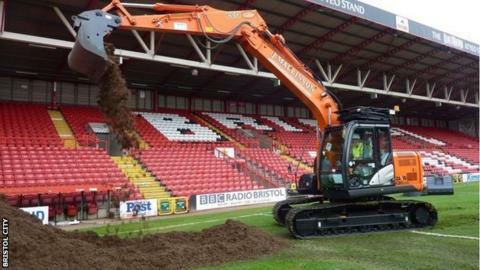 Bristol City will continue to play at the ground during the renovation in addition to Bristol Rugby. "The memories of the East End [Wedlock] will be there and it will be sad to see it disappear but this is a new beginning," said Lansdown. "To see it come down and the new stand start to go up is the start of what I believe will be a purple patch for the club. "Am I disappointed Ashton Vale didn't take place? Of course I am. But I'm pragmatic. The reality is this is what we can do and we can do it now." Billionaire businessman Lansdown became involved at City in 1996 and is thought to have invested over £50m in a bid to take them to the Premier League. However, they are set to finish the season mid-table in League One after initially fighting a relegation battle. But their form improved dramatically after the appointment of Steve Cotterill as manager in December, and Lansdown believes the stadium redevelopment could help them reach the top flight. "Seeing teams like Burnley going back up there again gives us all hope," added Lansdown. "Burnley, in terms of stadium size and fan base, are smaller than Bristol City. There's a great opportunity for us when we get it right. "We've turned the corner this season to start getting things in the right place, to build us a Premier League outfit." Read more on Why does Bristol never build anything?